For Andrew’s birthday this year, I bought him a book on mountain biking in the Bay Area, along with the promise that I would come out for a ride at least once. This ride came from that book, and seemed like a good starter ride for those none too confident in their bike riding skills (like myself). 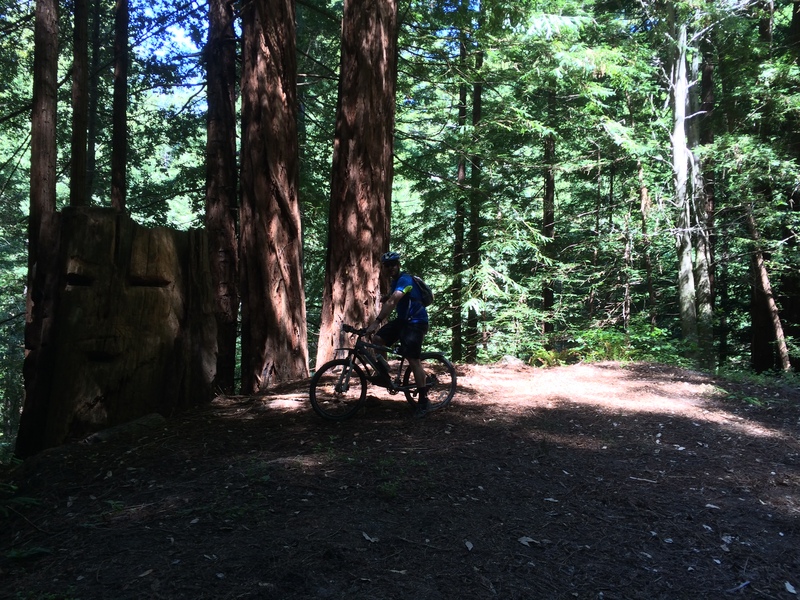 The ride took us along the Old Haul Road trail from Wurr Road right into Portola Redwoods State Park. You can get the park brochure here. You follow Old Haul Road right to the SP boundary, where a signpost directs you into the park. 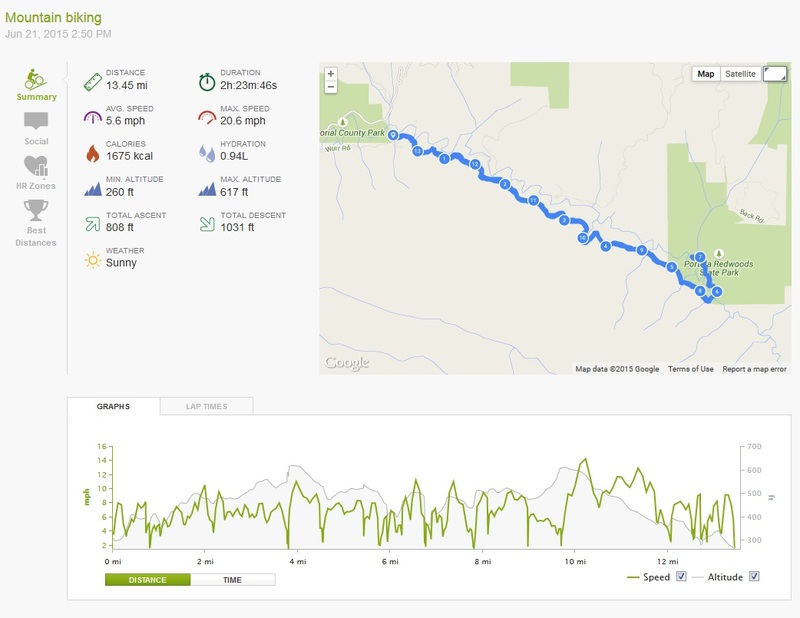 The book quotes the ride as being 12 miles, but as you can see below, Endomondo disagrees a little. As you ride into the park down a steep bit of trail, you come across the remains of the Iverson Cabin. 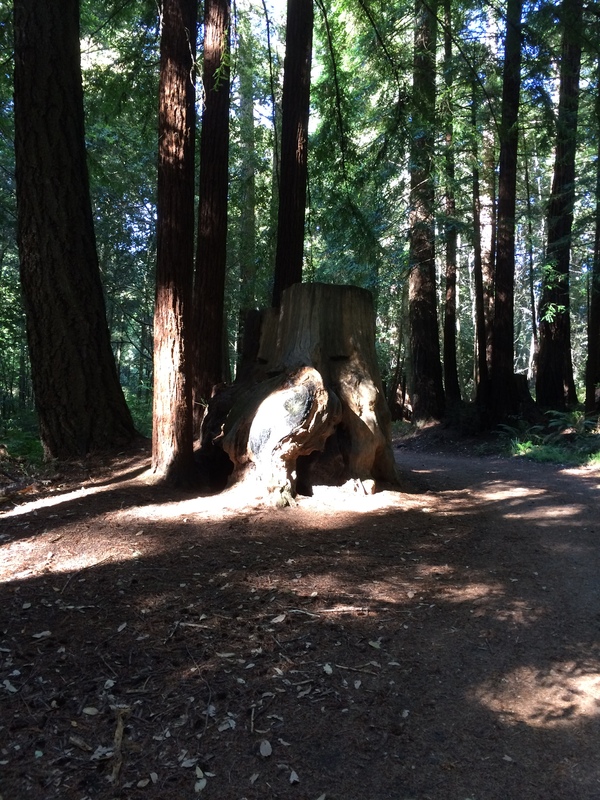 It had stood from the 1860s until Loma Prieta finished it off in 1989. 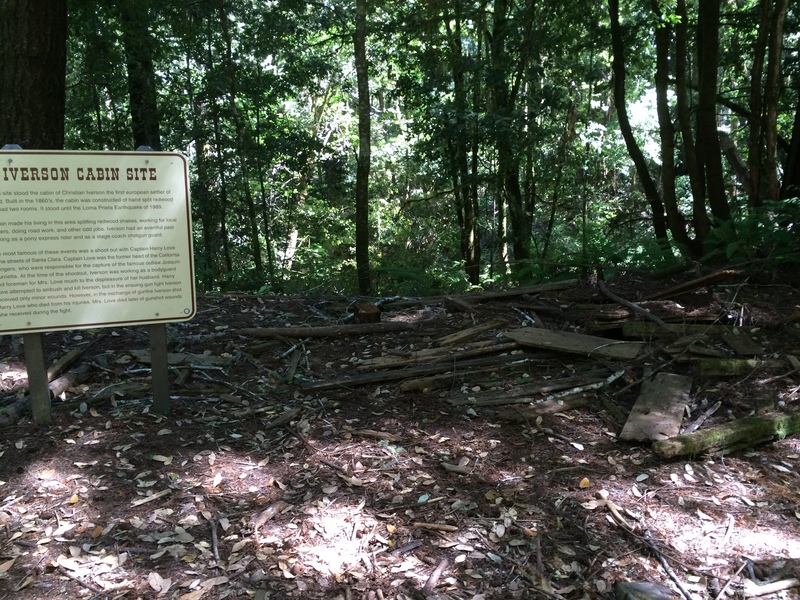 “At this site stood the cabin of Christian Iverson, the first european settler of record. Built in the 1860’s, the cabin was constructed of hand split redwood and had two rooms. It stood until the Loma Prieta earthquake of 1989. 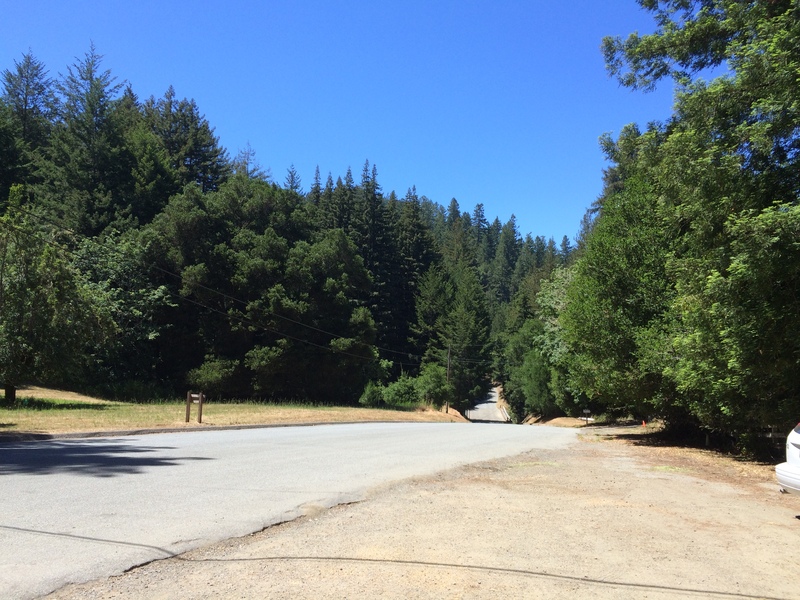 Iverson made his living in this area splitting redwood shakes, working for local farmers, doing road work, and other odd jobs. Iverson had an eventful past working as a pony express rider and as a stage coach shotgun guard. There is a visitor center in the park, along with restrooms and water, but the restrooms we went to beside the visitor center are closed to conserve water, so just behind the visitor center, there are instead portable toilets. I recommend you take some wipes or sanitizer for your hands! The trail is pretty smooth as is a road used by park trucks, and previously used to haul logs out of the woods in bygone days. It is also nice and shaded, which keeps things nice and cool. Overall it was a nice intro for me….. but I am still scared of going down hills! 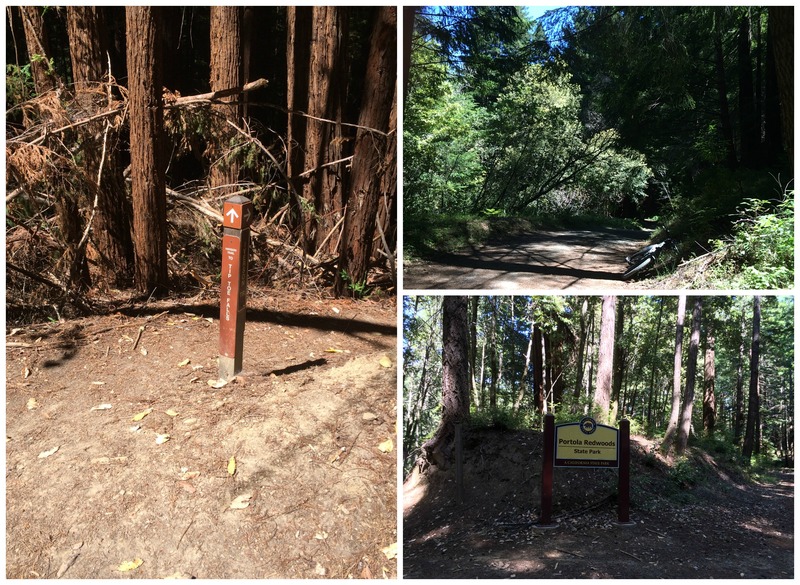 Note: you can also hike the exact same route, and there are some extra trails off the main trail that are closed to bikers, but open to hikers. Also, if any bikers fancy it, you can lock up your bikes at the visitor center and take a short hike to see some mighty big trees!